The agency also said DWR has doubled the flow down its main spillway 55,000 cubic feet per second (cfs) to 100,000 cfs to avert more erosion on the auxiliary spillway. “Based on information received from the California Department of Water Resources (DWR) and the incident command team managing Lake Oroville, counties and cities near Lake Oroville and the surrounding area issued evacuation orders for residents. 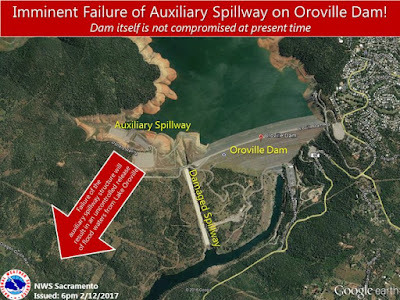 The concern is that erosion at the head of the auxiliary spillway threatens to undermine the concrete weirand allow large, uncontrolled releases of water from Lake Oroville. Those potential flows could exceed the capacity of downstream channels. To avert more erosion at the top of the auxiliary spillway, DWR doubled the flow down its main spillway from 55,000 cubic feet per second (cfs) to 100,000 cfs. The next several hours will be crucial in determining whether the concrete structure at the head of the auxiliary spillway remains intact and prevents larger, uncontrolled flows. Current flows are contained with downstream channels. At 6:08 pm the National Weather Service Sacramento issued a statement via Twitter: “#OrovilleDam itself is not compromised at current time. Failure would be on auxiliary spillway. See graphic for details. pic.twitter.com/..
Local agencies in regions that could be impacted by the auxiliary spillway failure also issued emergency evacuation orders. Nbcbay.com issued a #BREAKING UPDATE via Twitter: “Freeway jammed with cars as people evacuate area where Oroville Dam may collapse. nbcbay.com/... pic.twitter.com/...”. This tweet shows the confusion that some media outlets are having in understanding the difference between Oroville Dam, the primary spillway and the auxiliary spillway. 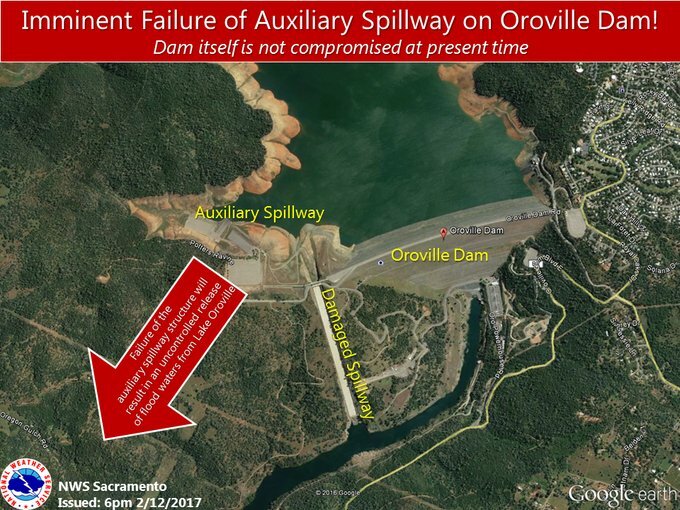 Actually Oroville Dam is not in danger of collapsing; it’s the auxiliary spillway that could fail. The San Francisco Chronicle accurately reported on the evacuation order: “Butte County residents near Lake Oroville, including the entire town of Oroville and nearby regions, were ordered to evacuate Sunday evening after the emergency spillway next to the reservoir’s dam suffered a possible structural failure, officials said. ‘There has been severe erosion of the emergency spillway and a possible structural breach that could send uncontrolled water down the stream,’ said Chris Orrock, a spokesman with the California Department of Water Resources. Finally, Mark Finan of KCRA 3 TV reported: "8pm, Lake Oroville was at 901.02'. Flow is now ending over the emergency spillway." Lets all pray and hope that the auxiliary spillway doesn’t fail. My heart goes out to everybody impacted by the evacuation. I will post more updates from local, state and federal agencies, media and NGOs as I receive them.